The advancement in technology has an impact on every sector and staffing is no exception. 2018 has brought about a lot of changes in recruitment tactics which will come to fruition in 2019. Some of these changes may have a long term impact on the industry while others might just be an experiment. Here’s a look at some of the most innovative staffing resource changes rolling out in 2019. Recruitment marketing is a strategy that implements marketing tactics when it comes to recruitment. The purpose of this strategy is to offer solutions on how to overcome the recent challenges in staffing. Adopting this technique will help you attract more talent, primarily because the technique will help you overcome the current labour market situations. This is done before the recruitment process begins. Recruitment marketing combined with the actual recruitment makes the process of staffing resources easier. Digital job search is not just limited to laptops or computers anymore. Statistics has proven that more and more people are using their mobile phones for conducting job search, while mobile platforms are becoming more common among job seekers. But this is not the case with most recruiters, who haven’t yet adopted mobile platforms for staffing resources. Similarly, paper resumes are a thing of the past. Most employers judge potential candidates on their social media profiles and video submissions. This means that candidates need to create an online image that is unique to their designation, such as digital portfolios, personal websites or blogs. Recruiters need to keep up with these trends to hire the best staffing resources. Video interviewing is not a trend of the past nor does the technique seem to be going away any time soon. If face-to-face interview is not an option, video interview is the next best option, mostly because it gives a better first impression than a phone call. It meets the interactive staffing needs and shows how an applicant responds in practical situations. AI has made an impact on almost every section of the work space, including staffing. In UK, more than 60% of employees have requested the help of AI in completing their work-related tasks. Since AI is changing the job description of most designations, staffing resource needs AI so that the best fitting employee can be found as per the skills required for a job. Staffing resources is a lengthy and time-consuming process. This is where a good recruitment automation tool can make your job easier. Automation tools are a type of software that combines the features of Applicant Tracking System and Recruitment Marketing Software to make it easier to hire talent. The primary goal of such tools is to find, attract, engage, nurture, and finally convert candidates to applicants. When it comes to automation tools, the organization that incorporates them finds more talent than their slow-moving counterparts. As discussed earlier, recruitment methods that involve decision-making and planning through the use of analytics tools are referred to as data-driven recruitment. A data-driven metrics can give you an idea about which of your hiring strategies work well and where you need to improve. Data-driven metrics can help you analyze your current staffing resource strategy and also give you an insight into the time taken to hire, cost required to hire, and quality of the hire, which will let you know how well your recruitment strategy works. There are a variety of employee referral programs that can help you effectively hire talent and fill open positions. When you take referrals from your current employees, it takes a much lesser time to hire talent and can save you the cost of hiring too. Most big firms hire 50% of their employees from referrals; giving them a good, reliable workforce. It can even become a standard recruitment tool in the future. Developing good relations with the current talent is just as important in today’s work environment. This not only helps you retain current talent but also make it easier to find reliable employees in the future. The working trends are changing and more and more employees are moving to freelance positions to maintain their work-life balance. In a time like this, offering flexible working conditions will come as a bonus to any prospective applicant. In fact, research proves that 70% of employees admitted that they would take up contract work, just to get the benefit of working from home. This doesn’t mean the entire workforce will just quit and take up freelance work, but it has most definitely changed employee expectations. An employer needs to understand this and offer appropriate flexibility to their employees. 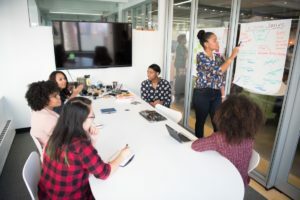 Employer branding is nothing but an organization’s reputation as an employer and it’s employee value reputation. It is a proven fact that 70% candidates search for employer reputation before even applying for a job. A company that gains a bad reputation will not just face difficulties in hiring talent but also in retaining them. There are a variety of employer branding ideas available online that can help you build a strong employer brand. Productive recruitment tools are improved each year, and staffing agencies make it a point to keep up with staffing resources to get maximum staffing efficiency. Most organizations seek the help of staffing agency to hire the best and the most dependable talent. Staffing resources in India can be difficult, primarily due to the sheer number of talent available for every open position. This is where staffing agencies can be beneficial. These are some common questions people have about staffing agencies. How much do staffing agencies make off their employees? Generally, staffing agencies charge 33.33% of first year’s total compensation plus administration charges. This cost usually guarantees that your employee will stay on for at least 1 year, and if the employee quits before that, then the replacement is done at no extra charge. 1/3 at candidate’s start date. Most big organizations consider this a worthy investment if they can find dependable talent. Employers can adjust with the workforce to meet the upcoming business demands. A temp agency can provide employers talent to meet the needs of the evolving market. Temp agencies have a broad range of candidates. This means that employers can get the most qualified staff based on their business requirements. With a temp agency, employers can save time that would be consumed in finding resources. A temp agency can find better candidates and in less time. Are temp workers independent contractors? Contractors may not have a college degree and in some cases may not have attended college at all. They earn lower hourly wages compared to temp workers. The length of their assignments is generally smaller. They could have most likely worked for a short-term for the staffing agency or have rotated between different agencies. These workers will most likely work in clerical work, or in industrial and healthcare sectors. Is a temp agency considered an employer? Temp agencies offer temporary workers to their clients. This means that temp agencies do not hire workers, they only find workers for their clients. The best candidates are sent to the employer for an interview. They provide short-term staff to compensate for an unexpected absence. When a particular position is open, employers contact a temp agency, who in turn find appropriate talent to fill the vacancies. Employers who do not want to take time out from everyday business tasks to see to the hiring of employees can contact such temp agencies to hire temporary workers for them. Workforce trends are changing and to keep up with these new trends, recruiters need to stay at par with the needs of their employees and the organization as a whole. Finding and hiring dependable employees is a difficult task in today’s candidate-driven market. Staying at the top of staffing requirements is the best way to find good talent.